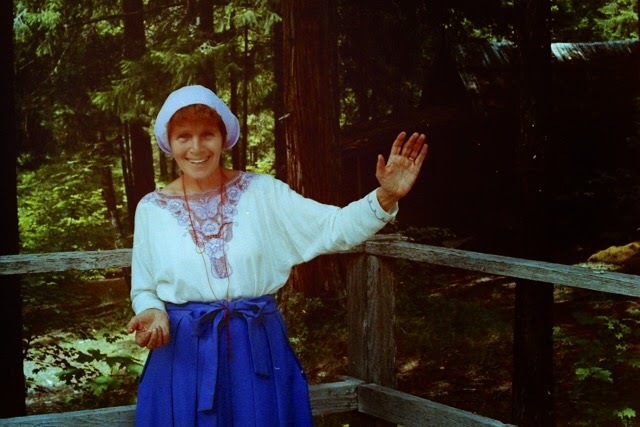 The great Dharma teacher Ruth Denison passed away at 3am this morning (PST), ten days after having a severe stroke. She was accompanied as she left us by a small loving group of close students, friends and carers. For me I am on the one hand sad that she has moved on, but on the other hand I feel so extraordinarily blessed and grateful that she chose to share her gifts and insight with the world. While Ruth was not my first teacher, she is my "Root Teacher," the one I first took refuge with and embarked on the path in a serious way. I know this because she told me. "I am your root teacher, I am Ruth!" She delighted in the fact that in her lovely German accent 'root' and 'Ruth' sounded identical. It is likely that many of you reading know little or nothing about Ruth. This is because unlike many teachers of our age she focused on the joy of spreading the Dharma personally. Despite the fact that she is a key figure in the development of Buddhism in the West, she chose not to promote herself, but instead to focus on a very intimate style of teaching. She didn't write books or go on press tours. There was no ego at all. Just determination, honesty and a wicked sense of humor. I would love for more people to know about the great work Ruth did. If you would like to know more, this Spirituality and Health article is a good starting point. There are also many pictures, audio and video links at the site "RuthDenison.com", maintained by local teacher Robert Beatty. Robert was with Ruth when she died, so I am sure there will be more tributes posted there. I can also highly recommend the book "Dancing in the Dharma" by Sandy Boucher. This gives great details of Ruth's extraordinary life and contribution. Above all I want to say to Ruth: Thank you, for all you gave us. You will always be in our hearts. Sorry for your loss Chris. 2015 has had a rough start. Sorry for your loss Chris. She sounds like an amazing person.